These two storied teams have already met twice in Euroleague Championship Games and in four Final Fours. Now FC Barcelona and Olympiacos Piraeus square off with just a single Final Four ticket available. FC Barcelona and Olympiacos Piraeus have only played 18 times prior to this season, but a great many of those were games of great significance. They met in the 1997 Euroleague Championship Game and in three Final Fours between 2009 and 2012. The overall standings favor Barcelona: Barca leads the all-time series 13-5 and has won eight of their last nine meetings. Barcelona is also 7-0 all-time against Olympiacos at home. However Olympiacos can claim victory in some of the most important games; the Reds beat Barcelona in the 1997 final and the 2012 semifinals on the way to two of the club's three continental trophies. David Rivers starred with 26 points as the Reds claimed a 73-58 win in the 1997 final in Rome. Barcelona avenged that loss in the 2010 championship game when Juan Carlos Navarro poured in 21 points in an 86-68 victory in Paris. In between, Barcelona bested Olympiacos 79-95 in the 2009 Third-Place Game in Berlin. In 2012, Vassilis Spanoulis tallied 21 points and 6 assists in a 68-64 semifinals victory in Istanbul. 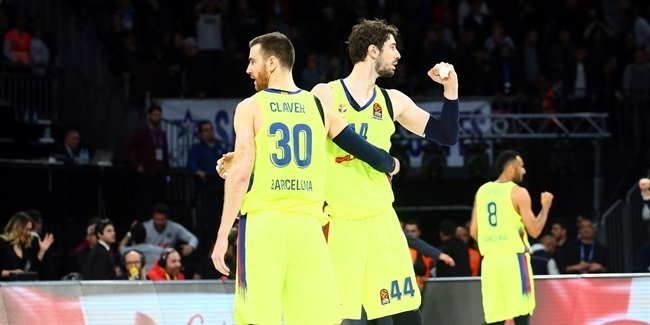 Last season, Barcelona swept Olympiacos in the Top 16 behind one big game from Navarro (21 points), another from Ante Tomic (14 points, 11 rebounds) and a pair of strong showing from Brad Oleson (14.5 ppg., 6 of 10 three-point shooting). When looking for the two most accomplished players of last decade, you needn’t look any farther than this series. They are Juan Carlos Navarro and Vassilis Spanoulis. They have won more All-Euroleague selections than any other players. Both are multiple-time Euroleague champs, former Euroleague MVPs and Euroleague Final Four MVPs. Navarro, the Euroleague’s career scoring king, is the all-time leader with seven All-Euroleague nods – including being five times on the First Team. Spanoulis, the only other active player among the top 10 career Euroleague scorers, is a six-time All-Euroleague honoree. No other active player has more than four. The two combined for four Final Four MVPs between 2009 and 2013; Spanoulis won in 2009, 2012, 2013. Navarro won in 2010. Their battle to be the best will now continue against one another in the playoffs. When it comes to storming into the playoffs with all the momentum, no one does it quite like FC Barcelona. The Spanish champs bring an eight-game undefeated streak into the playoffs this season. Of the six longest winning-streaks entering the playoffs since the current format was adopted for the 2004-05 season, four are Barcelona’s. The club won 10 straight in 2013 and seven in a row in both 2011 and 2012. The longest run was a whopping 17 straight wins for CSKA Moscow in 2007 and Tau Ceramica Vitoria (today known as Laboral Kutxa) also won eight straight in 2007. So how has that fantastic momentum served these clubs? CSKA dropped one playoff game in Tel Aviv to Maccabi before winning that series and getting the Euroleague Championship Game. Laboral swept Olympiacos in the playoffs, but lost the Euroleague semifinal to Panathinaikos. Barcelona’s 2013 squad knocked out Panathinaikos in the playoffs, but lost to Madrid in the Euroleague semifinal in London. The good news for Barcelona is that no team with at least eight straight wins entering the playoffs has lost its playoff series. The bad news is that none of those teams went on to win the Euroleague. Barcelona of the past generation has been known for its defense above all else. The team is the competition’s all-time leader in performance index rating against with just 68.3 allowed over 334 Euroleague games. Barcelona is also third all-time in scoring against, having allowed just 71.5 points. 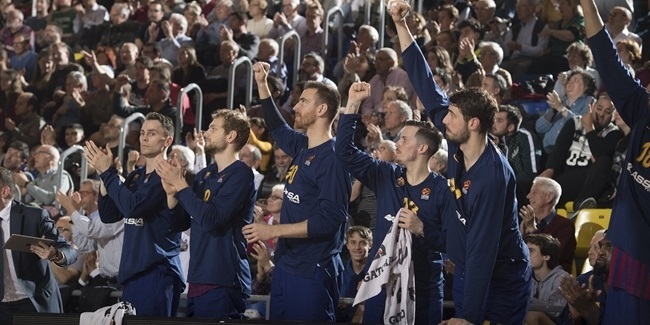 However this season with scoring and production up slightly – the league leader in index rating allowed, Unics Kazan, has allowed 73.5 – Barcelona has remained tough on defense (third with 75.1 average index rating against), but turned its overall production up a notch; Barca is third in the Euroleague in performance index rating (98.3) and scoring (83.6 ppg.) this season. In fact, its index so far this season is on pace for one of the top 10 in competition history. With such efficient production on both ends of the floor, it’s no wonder Barcelona is once again a serious Euroleague contender. Despite not holding anybody below 70 points in the last 10 games coming into the playoffs, Olympiacos defense ranked first this season as it allowed on average 71.6 points per game. The Reds were particularly tough to score against in the paint this entire season, holding opponents to third-lowest 45.9% two-point accuracy, and they were in top echelon of teams when it comes to perimeter defense, too, as teams hit on only 33.6% of their three-point shots in 24 games against Olympiacos. It all led to Olympiacos holding opponents to score in the 60s nine times during this campaign - five times during the regular season, as well as in the four opening weeks of the Top 16. The last time Olympiacos lost at home in the Euroleague playoffs was in the Game 2 in 2010-11 when Montepaschi Siena won 65-82 on its way to eliminating the Reds. In the past three seasons, however, Olympiacos has won all seven playoff games it has played in Piraeus. 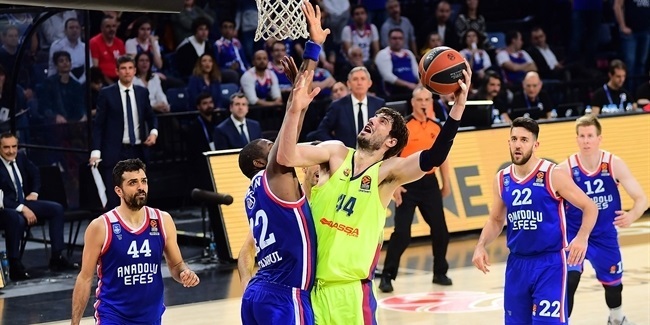 It beat Siena in Games 3 and 4 in 2011-12 on its way to a Euroleague title, it beat Efes in Games 1, 2 and 5 on its way to the title defense in 2012-13, while last year Olympiacos beat Real Madrid in Games 3 and 4, before Madrid prevailed on its home floor in the decisive Game 5. Regardless, eight players currently on Olympiacos' roster have been part of that winning run at Peace and Friendship Stadium. The Reds' backcourt partners, Vasilis Spanoulis and Kostas Sloukas, along with team captain Georgios Printezis, have been with the club in each of the three seasons that Olympiacos has not lost at home in the playoffs. Vangelis Mantzaris has also been with the club the past three season, but has missed most of the 2012-13 season with injury. Oliver Lafayette of Olympiacos and Justin Doellman of Barcelona played for Valencia Basket last year and won the Eurocup title. Doellman was also an All-Eurocup selection and the Eurocup Finals MVP last season. Both players have a chance to become the first ever to win a Euroleague title a year after winning Eurocup. Only 13 players in the history of the game have won both the Eurocup and Euroleague titles in their careers, and one of them is Maciej Lampe. A Barcelona forward the past two seasons, he won Eurocup with Unics Kazan in 2011.